Who´s your kids´ favorite character right now? Put him in frames! 1. Choose the pictures together with the kids. You can use the whole magazine or cut and use only the cover. 2. 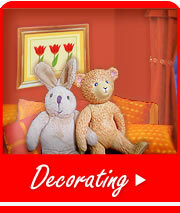 Choose the background paper to match the colors of the picture you´ve chosen and the decoration of the room. 3. Glue the cover or the whole magazine in the middle of the background paper. 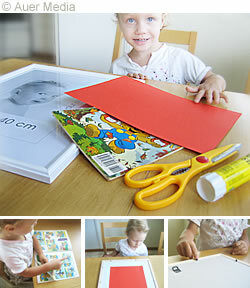 Glue the paper in the middel of the white background paper that you got with the frames. 4. Put all the pieces together and hang fine pictures on the walls.